بررسی قابلیت انتقال رسوب کانال، یکی از عوامل مهم در طراحی سیستم‌های دفع فاضلاب و زهکشی آبهای سطحی شهری است. کاهش ظرفیت هیدرولیکی جریان در نتیجه ته‌نشینی ذرات رسوبی مشکلات عدیده‌ای را ایجاد می‌کند. طراحی کانال بر اساس معیار خودشویی، ته‌نشینی رسوب در جریان را به حداقل رسانده و از کاهش ظرفیت هیدرولیکی جریان جلوگیری می‌کند. بررسی ادبیات پیشینه موضوع نشان می‌دهد که مدل خودشویی برای کانال ذوزنقه‌ای پیشنهاد نشده است.در این تحقیق آزمایش‌ها برای بررسی شرایط خودشویی عدم ته‌نشینی با بستر تمیز در یک کانال با مقطع ذوزنقه‌ای انجام شد. آزمایش‌ها با استفاده از چهار اندازه ذره رسوبی و در شیب‌ها و دبی‌های محتلف انجام شد. بر پایه داده‌های آزمایشگاهی و با در نظر گرفتن پارامترهای جریان، سیال، رسوب و کانال، یک مدل خودشویی بار بستر برای کانال ذوزنقه‌ای پیشنهاد شد. مدل ارائه شده در این تحقیق با مدل‌های متناظر در پیشینه موضوع بر اساس دو شاخص آماری ریشه میانگین مربعات خطا و درصد میانگین مطلق خطا بر روی داده‌های آزمایشگاهی به‌دست آمده برای کانال ذوزنقه‌ای مقایسه شد. بر اساس نتایج به‌دست آمده، شکل سطح مقطع کانال عاملی مؤثر برای تعیین سرعت خودشویی کانال است. به‌دلیل اینکه شکل مقطع کانال بر روی مقاومت جریان تأثیر می‌گذارد، مدل‌هایی که پارامتر ضریب اصطکاک کانال را به‌عنوان متغیر مستقل استفاده کرده‌اند، دارای قابلیت محاسباتی بهتری می‌باشند. 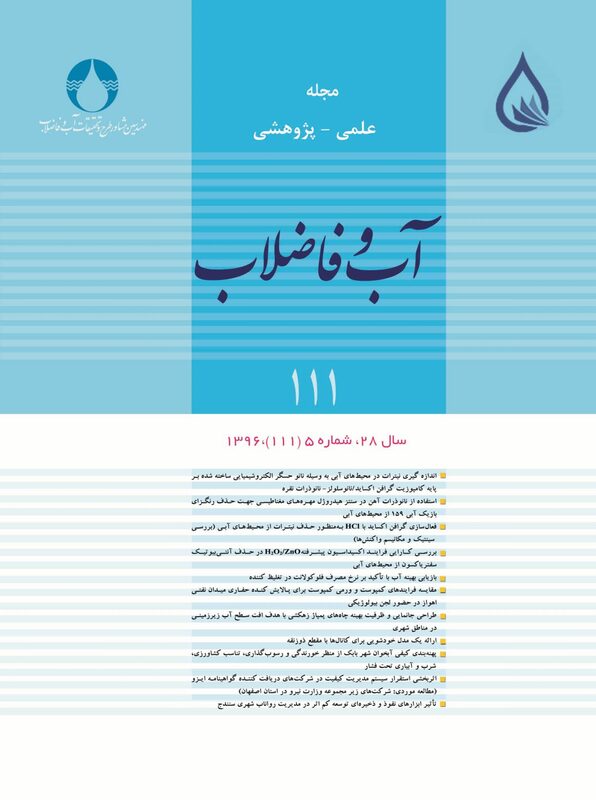 نتایج این تحقیق نشان داد که مدل‌های خودشویی ارائه شده برای کانال‌های دایره‌ای و مستطیلی به هنگام کاربرد در کانال ذوزنقه‌ای خطایی نزدیک به 15 درصد دارند. مدل ارائه شده در این تحقیق برای طراحی کانال‌های با جداره صلب با شکل سطح مقطع ذوزنقه‌ای توصیه می‌شود. Ab Ghani, A., 1993, "Sediment transport in sewers", PhD Thesis, University of Newcastle Upon Tyne, UK. Arora, A. K., Ranga Raju, K. G. & Garde, R. J., 1984, "Criterion for deposition of sediment transported in rigid boundary channels", Channels and channel control structures., Springer Berlin Heidelberg, 413-424. Butler, D., May, R. W. P. & Ackers, J. C., 1996, "Sediment transport in sewers. Pt. 2: Design", Proc. Instit. Civ. Eng., 118(2), 113-120. Bong, C. H. J., Lau, T. L. & Ab Ghani, A., 2013, "Verification of equations for incipient motion studies for a rigid rectangular channel", Water Science and Technology, 67(2), 395-403. Butler, D. & Davies, J., 2004, Urban drainage, CRC Press, Boca Raton. Butler, D., May, R. & Ackers, J., 2003, "Self-cleansing sewer design based on sediment transport principles", Journal of Hydraulic Engineering, 129(4), 276-282. Camp, T. R., 1946, "Design of sewers to facilitate flow", Sewage Work Journal, 18(1), 3-16. CIRIA, 1986, Sediment movement in combined sewerage and storm-water drainage systems. Phase 1. Project report, London: CIRIA research project No. 336. Loveless J. H., 1992, "Sediment transport in rigid boundary channels with particular reference to the condition of incipient deposition", PhD Thesis, University of London. Macke, E., 1982, "About sedimentation at low concentrations in partly filled pipes", PhD Thesis, Technical University of Braunschweig, Germany. May, R. W. P., Ackers, J. C., Butler, D. & John, S., 1996, "Development of design methodology for self-cleansing sewers", Water Science and Technology, 33(9), 195-205. May, R.W.P., 1993, Sediment transport in pipes and sewers with deposited beds, Technical Report, Hydraulic Research Ltd., Report SR 320, Wallingford, UK. Mayerle, R., 1988, "Sediment transport in rigid boundary channels", PhD Thesis, University of Newcastle Upon Tyne, UK. Mayerle, R., Nalluri, C. & Novak, P., 1991, "Sediment transport in rigid bed conveyances" Journal of Hydraulic Research, 29(4), 475-495. Mohammadi, M., 2005, "The initiation of sediment motion in fixed bed channels", Iranian Journal of Science and Technology, 29(B3), 365-372. Nalluri, C. & Ab Ghani, A., 1996, "Design options for self-cleansing storm sewers", Water Science and Technology, 33(9), 215-220. Nalluri, C., Ab Ghani, A. & El-Zaemey, A. K. S., 1994, "Sediment transport over deposited beds in sewers", Water Science and Technology, 29(1-2), 125-133. Novak, P. & Nalluri, C., 1984, "Incipient motion of sediment particles over fixed beds", Journal of Hydraulic Research, 22(3), 181-197. Ota, J. J. & Nalluri, C. 2003, "Urban storm sewer design: Approach in consideration of sediments", Journal of Hydraulic Engineering, 129(4), 291-297. Safari, M. J. S., 2016, "Self-cleansing drainage system design by incipient motion and incipient deposition-based models", PhD Thesis, Istanbul Technical University, Turkey. Safari, M. J. S., Aksoy, H. & Mohammadi, M., 2015, "Incipient deposition of sediment in rigid boundary open channels", Environmental Fluid Mechanics, 15(5), 1053-1068. Safari, M. J. S., Mohammadi, M. & Gilanizadehdizaj, G., 2013, "Investigation on incipient deposition and incipient motion of sediment particles in rigid boundary channels", Water and Soil Science, 23(3), 13-25. Safari, M. J. S., Mohammadi, M. & Gilanizadehdizaj, G., 2014, "On the effect of cross sectional shape on incipient motion and deposition of sediments in fixed bed channels", Journal of Hydrology and Hydromechanics, 62(1), 75-81. Safari, M. J. S., Mohammadi, M. & Manafpour, M., 2011, "Incipient motion and deposition of sediment in rigid boundary channels", Proceedings 15th International Conference on Transport and Sedimentation of Solid Particles, Wroclaw, Poland, 63-75. Vongvisessomjai, N., Tingsanchali, T. & Babel, M. S., 2010, "Non-deposition design criteria for sewers with part-full flow", Urban Water Journal, 7(1), 61-77.